The one simple thing you need to do to make life easier. That’s the phrase I’m using these days to help me stay aligned with the experiences I most want to enjoy in life. I love expecting things to be easy, to be fun, to happen exactly when they should and in the best possible way. Of course, what supports this way of thinking is to be unattached to the outcome. That’s why I also love trusting that everything happens for my highest good even when I don’t yet realize it . The first time I heard her say it, I wrote it down and kept it in view. Then, I started saying it to Michael and a few close friends knowing that the more I spoke it, the quicker it would get installed in my brain. 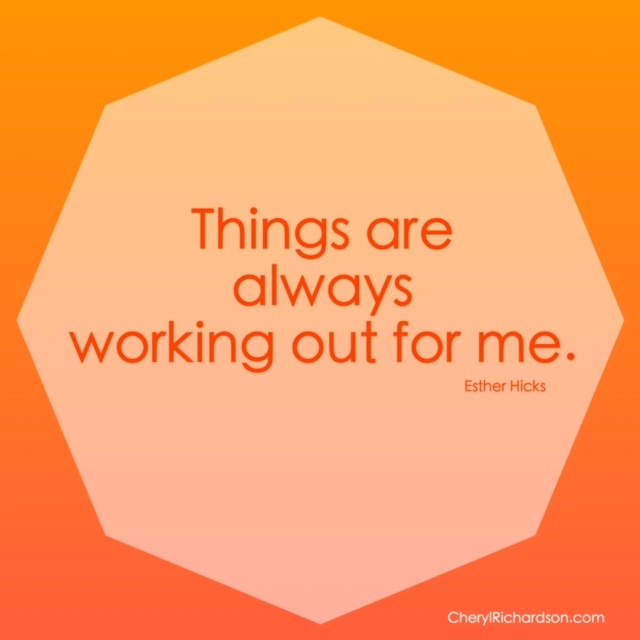 Within no time, I began to see how the expectation “things are always working out for me” began showing up in my life. For example, I was invited to an exciting event in Los Angeles at the exact same time I’d scheduled an important appointment. When I called to see if I could reschedule my appointment (something that’s typically very difficult to do) I was told there’d been a cancellation and they could fit me in a week earlier. I shared this affirmation with a good friend who was visiting from Europe and she decided to adopt it for herself. While here, she needed to find a magazine for work that she could only get in the states. We’d looked everywhere to no avail only to find it sitting on the counter at a clothing store where we were shopping one afternoon. I’ve been so excited about how this expectation has worked that I wanted to share it with you so you can use it, too. It’s a comforting affirmation. Give it a couple of weeks and you’ll be amazed by what happens.